As a child, my Mom and I would often go out to a Chinese restaurant in a small shopping complex. Whenever we'd go to the Phoenix Garden I almost always ordered the Szechuan Chicken. I didn't know a ton about flavors as a kid, but I knew I liked garlic and I liked spicy things (although I became less vocal about liking spicy things a few years later, while visiting family in Texas and ate the better part of a raw jalapeno from my uncle...the next 30 minutes were unpleasant). I have a lot of fond memories of that restaurant, but truth be told, I'm not sure if they used real Szechuan peppers in their dish. 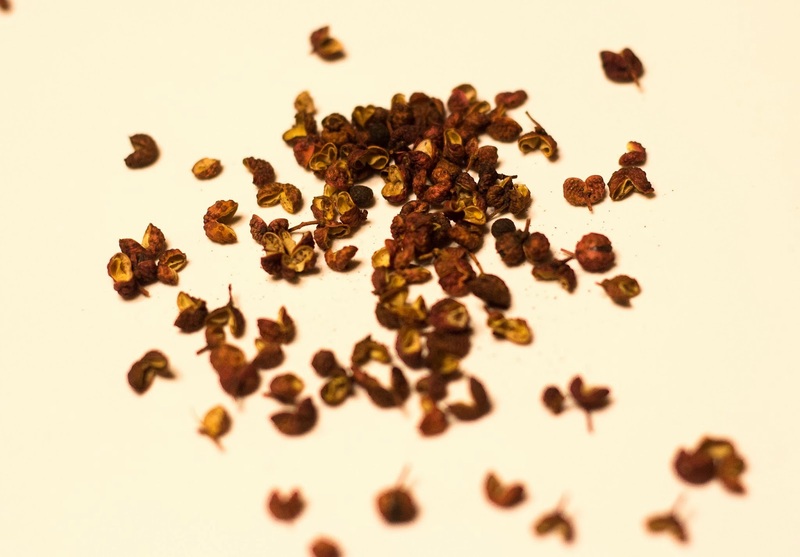 Also spelled as Sichuan peppercorns, these small globes are a dusty rose color with a prickly texture. Oh, also they're not peppercorns. They are the dried seed husks of the prickly ash tree. I remember the first time I tried them on their own - I thought I had a mouthful of Novocain. A second strange fact about these "peppercorns" is that they're not peppery or hot - they numb the mouth and leave a gently tingling and throbbing sensation due to the presence of hydroxyl alpha sanshool. This compound gives your mouth the pins-and-needles feeling, as if your cheeks and lips had fallen asleep mid-bite. What's even wilder about this compound is that scientists are not totally sure how it works. They believe it interacts with your taste buds in a different way that the capsicum of a chili pepper, but on the same receptors. This was also noticed in Sichuan china, after chili peppers were introduced and they paired them with the local prickly ash berries. This gives true Sichuan cooking an incredibly complex flavor, as the chile peppers and the Sichuan peppercorns are both working on the same taste receptors, but in very different ways. One is setting your mouth on fire, the other is numbing it. 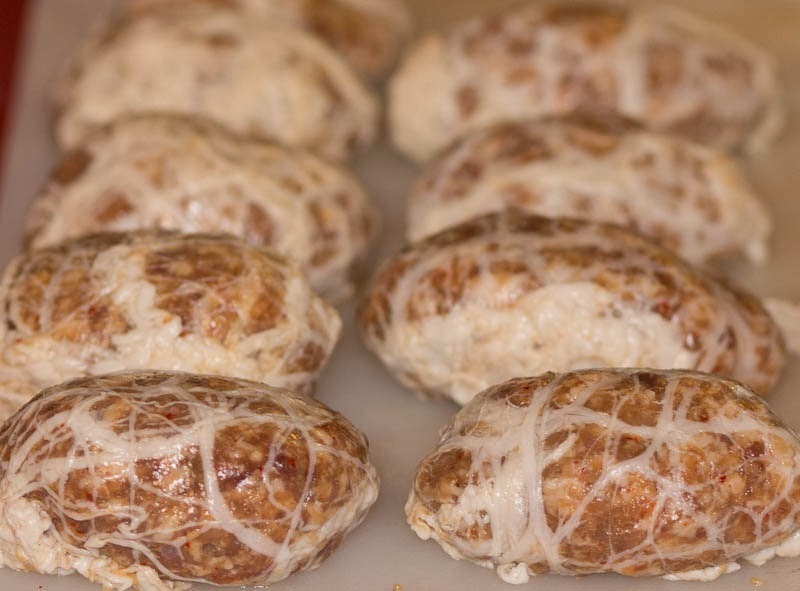 Meanwhile, back in Pennsylvania, I've been thinking of making a Chinese-style sausage for a while, and thought making a slightly spicy one that used both Sichuan peppercorns and red pepper flakes would be particularly interesting. Chinese dried sausages are used for both cooking and eating plain, so I made my caul-fat bundles again to cure the salami. This would give me tidy salami orbs that I could either slice thin or cube for cooking. A blend of garlic, Sichuan peppercorns and Korean gochugaru, rounded out the flavors. I let the salami cure with TSP-X culture for three days, then gently smoked them for a few hours. Along with adding a smoky note to the pork, I found this really helps to seal the caul fat casing. I couldn't find anyone who has attempted a similar recipe, so I started with 30 grams (a little over 2 tablespoons) of Sichuan peppercorns for a kilogram of ground pork shoulder and backfat. With curing, some flavors seem to intensify (like clove or mace) while others don't seem to get much stronger (garlic never seems to be more than a background flavor in fully cured meat), so I'm curious if this amount will turn out to be too strong, too faint, or just right. These are small salami, so they should cure quickly and I can find out how my first swing at this turned out. How did these end up? I was thinking about salami possibilities and sichuan peppercorns came up as an interesting possible addition to a rustic Finocchiona style salami. They turned out really good...but the sichuan peppercorns could easily be doubled to 60 grams. The salami tastes like a nicely smokey, slightly spicy salami, but that mouth tingling tickle from the sichuan is missing. Perhaps the curing process softens the impact of the sichuan peppercorns? If you proceed with your recipe, let me know how it turns out!